The UNC Maternal-Fetal Medicine Fellowship program participates in the electronic application submission process ERAS. The application deadline for the fellowship is May 31 . Letters of support may be mailed separately and must be received by May 31. Applicants are notified during the summer about interviews for the available two positions. For additional questions about this fellowship, please contact Fellowship Director Dr. Robert Strauss or Fellowship Coordinator Qiana Davis. Our mission is to prepare highly skilled subspecialists dedicated to the care of pregnant women and their fetuses, spanning the breadth and depth of the specialty. To achieve this, the educational experiences are tailored to the fellow’s interests and needs. Acquisition and development of research skills is an important component of the educational process and critical and analytic thinking are an expectation for completion of the fellowship. The faculty of the division of maternal-fetal medicine supports the clinical and research missions of the fellowship training program by mentoring fellows to achieve future successes as clinicians, academicians and as national leaders in maternal-fetal medicine. Track 2: Masters in Public Health Track – fellow pursues a Master Degree in Public Health in Maternal Child Health, Epidemiology, Health Behavior, Health Policy and Administration, or Biostatistics through the UNC School of Public Health. Fellows in either track are assigned 12 months of core maternal-fetal Medicine clinical rotations, 18 months of dedicated research time (at which time fellows in MPH track complete their coursework), and six months of electives (one month each of NICU, ICU, OB Anesthesia, Pediatric Cardiology, Genetics, plus a one month selective, where the fellow chooses the rotation). Fellows are clinical faculty in the Department of Obstetrics and Gynecology and they actively participate in the education and supervision of medical students and residents. 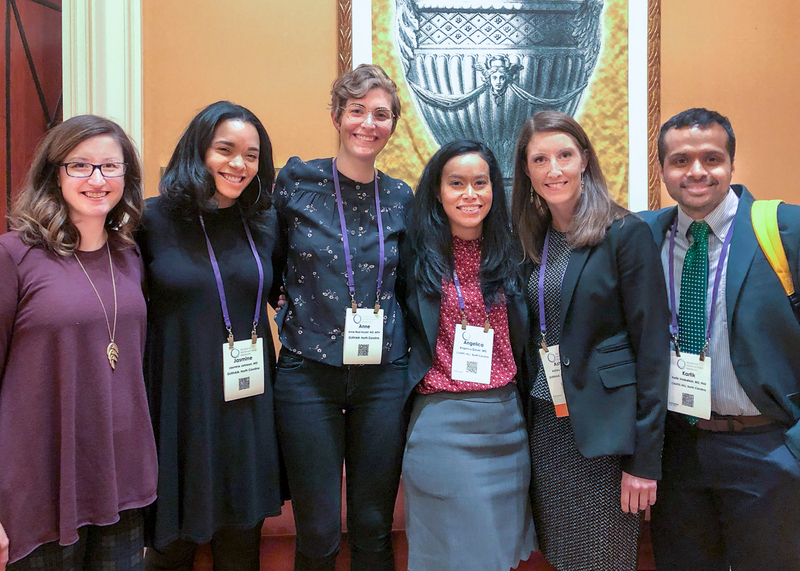 UNC MFM 2019 Fellows at the Society for Maternal-Fetal Medicine annual meeting.